- Jake Novak, CNBC, "Here's the $156 Billion in Wasteful Military Spending Trump Should Slash"
"What We're Reading This Summer"
"A distressing and tremendously helpful resource for grappling with the global geography of the American armed forces.... I hope that Vine’s book will be read and discussed by those with the ability to orchestrate the changes he calls for." "Base Nation offers a devastating critique, and no doubt Washington will try to ignore it. Citizens should refuse to let that happen." - Andrew J. Bacevich, author of "Limits of Power"; "Breach of Trust"
"Pentagon officials and members of Congress should pay close attention to Vine's arguments in favor of reducing our foreign presence in the interest of strengthening the future security posture of U.S. military forces and the fiscal health of our nation." From Italy to the Indian Ocean, from Japan to Honduras, the far-reaching story of the perils of U.S. military bases overseas -- and what these bases say about America today…. American military bases encircle the globe. More than two decades after the end of the Cold War and nearly three-quarters of a century after the last battles of World War II, the United States still stations troops at some eight hundred locations in foreign lands. These bases are usually taken for granted or overlooked entirely, a little-noticed part of the Pentagon’s vast operations. 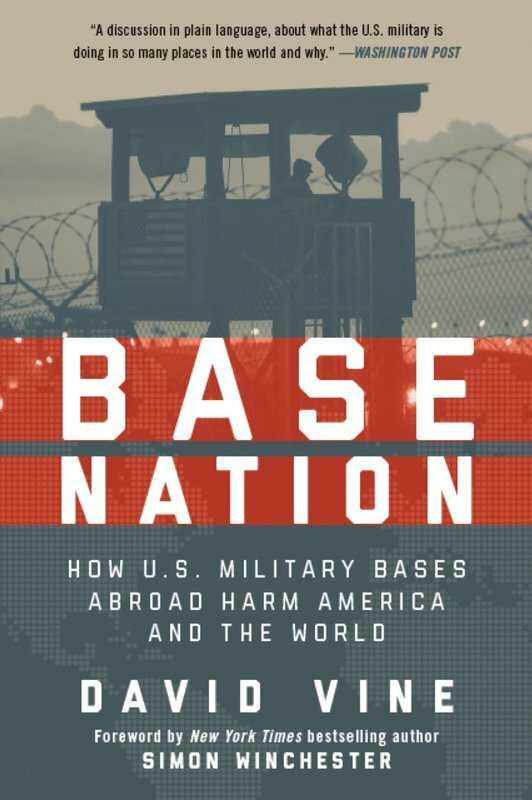 But, in an eye-opening exposé, Base Nation shows how this global base network causes an array of ills—and undermines national security in the process. As David Vine demonstrates, the overseas bases raise geopolitical tensions and provoke widespread antipathy toward the United States. They undermine American democratic ideals, pushing the United States into partnerships with dictators and perpetuating a system of second-class citizenship in territories such as Guam. The far-flung bases strain the lives of military families, breed sexual violence, displace indigenous peoples, and destroy the environment. Their financial cost is staggering: though the Pentagon tries to underplay the numbers, Vine’s accounting proves that the true bill approaches $100 billion or more per year. And by making it easier to wage interventionist wars far from home, overseas bases have paved the way for disastrous conflicts that have cost countless lives. For decades, the need for overseas bases has been a quasi-religious dictum of U.S. foreign policy. Recently, however, a bipartisan coalition has finally started questioning this conventional wisdom. With U.S. forces still in Afghanistan, the Middle East, and beyond, Vine shows why we must reexamine the tenets of our military strategy, the way we engage with the world, and the base nation that America has become. The author will donate all proceeds from Base Nation's royalties and honorariums from talks to nonprofit organizations serving military veterans, their families, and other victims of war and violence. Donations have gone to organizations including Doctors without Borders, Wounded Warriors Family Support, Service Women's Action Network, Partners in Health, Emergency, Iraq Veterans against the War, Amnesty International, We Are Guahan, Chagos Refugees Group, and Honduras Solidarity Network. All Base Nation proceeds donated to nonprofit organizations serving military veterans, their families, and other victims of war and violence.